Andalucía is an autonomous community of Spain. It is the second largest, in terms of land area, of the seventeen autonomous communities of the Kingdom of Spain. Its capital and largest city is Seville (Spanish: Sevilla). The region is divided into eight provinces: Huelva, Seville, Cádiz, Córdoba, Málaga, Jaén, Granada and Almería. Andalusia is in the south of the Iberian peninsula, immediately south of the autonomous communities of Extremadura and Castile-La Mancha; west of the autonomous community of Murcia and the Mediterranean Sea; east of Portugal and the Atlantic Ocean; and north of the Mediterranean Sea, the Strait of Gibraltar, which separates Spain from Morocco, and the Atlantic Ocean. The small British overseas territory of Gibraltar shares a three-quarter-mile land border with the Andalusian province of Cádiz at the eastern end of the Strait of Gibraltar. Andalusia has three major geographic subregions. In the north, the mountainous Sierra Morena separates Andalusia from the plains of Extremadura and Castile-La Mancha on Spain's Meseta Central. South of that, one can distinguish Upper Andalusia—generally the Baetic Cordillera—from Lower Andalusia—the Baetic Depression of the valley of the Guadalquivir. The name Andalusia traces back to the Arabic language Al-Andalus and Andalusia was the center of power in medieval Muslim-dominated Iberia. Besides Muslim or "Moorish" influences, the region's history and culture have been influenced by the earlier Iberians, Carthaginians, Greeks, Roman Empire, Vandals, Visigoths—all of whom preceded the Muslims—and, of course, the Castilian and other Christian North Iberian nationalities who conquered the area in the latter phases of the Reconquista. Since the Industrial Revolution, Andalusia has been an economically poor region in comparison with the rest of Spain and the European Union at large. Agriculture and the service sectors predominate in the economy. The region has, however, a rich culture and a strong cultural identity. Many cultural phenomena that are seen internationally as distinctively Spanish—for example, flamenco, bullfighting, and certain Muslim-influenced architectural styles—are largely or entirely Andalusian in origin. Casa Sunflower is a luxury villa located on the edge of the Andalucia town of Coín in the heart of the Costa del Sol only 25 mins from Malaga Airport and 20 mins to the nearest beach. The villa is furnished and presented to the highest standards all with modern taste and design. The villa is fully equipped with the latest appliances and gadgets. Privately owned we pride ourselves in providing you everything you could require for you holiday, we have added a lot of personal touches and extras for you to make you feel at home and welcome. Our Villa is located on the exclusive Sierra Gorda urbanization. South facing with spectacular and breathtaking views of the Gualdaforce valley overlooking the nearby towns of Coin and Alhaurin el Grande. The colour of the valley changes throughout the seasons from the green winter to the yellows of high summer, during the day the villages in the distance look like small white Lego bricks and night the lights sparkle like stars. Sleeps 8. Finca La Pura translates into English as Farm of the pure. No we did not name it so. It is it,s historical name and is a very old house. There has been a house on this farm and on more, or less the same site for some 2000 years and possibly longer. Finca La Pura lies in the heart of the Sierra Las Nieves nature reserve, a beautiful part of rural Andalucia, in what is reffered to as "The real Spain". You will find fragments of pottery within the house which have been dated as Roman, or pre Roman. Why has this small part of Spain been so popular through the ages? In part through a natural spring that feeds it even during the long hot summer months. A mineral water bottling plant has now been established at the bottom of the valley taking water from a nearby source. Golf, the beach, fishing, and hill walking are just some of the activities available from this private Villa, or maybe you would prefer to relax by the private pool. Sleeps 9. Rural Spanish country house "cortijo" with own pool, BBQ, Sky TV, air conditioning and wi-fi internet connection. Sleeps 8. Separate "pool-house". 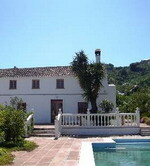 Tranquil, spacious, 4 bedroomed property, recently renovated in the hills of the Montes de Malaga. Near to the town of Colmenar which is only half a mile away, yet far enough away to ensure peace and relaxtion for your stay in Andalusia. Wonderful panaromic views and own swimming pool - The property boasts a private pool, and en-suite pool house. BBQ area. Sky TV (UK) and Canal+ TV (Spain), wireless broadband connection, fully equipped kitchen, parking for up to 6 cars and cot. Fully furnished and ready for occupation! Sleeps 9. This well-positioned villa is detached and has good-sized family accommodation. The spacious hallway leads to a bright attractive lounge with a wood-burning fire, a leather suite seats 6 and is made up of a 3 and 2 seater and chair. The dining area has a large oval glass table with 6 chairs. A widescreen television complements the room with sky and dvd player. The room also has two ceiling fans. Two double patio doors leading to the conservatory. In here is a smaller table for eating out with four chairs and a fridge for chilling your beers and wine. A further 3 wicker chairs and small wicker table make for easy lounging while listening to the CD player. A clothes airer, ironing board and iron are also here. The kitchen is well fitted and has quality fixtures and fittings. An electric hob and fan oven, microwave, fridge, dishwasher, deep fat fryer, toaster, sandwich maker and plenty of pots, pans and utensils. Sleeps 6. Choose Villa Gareth, and you will not be disappointed, for you will find a truly special place of panoramic beauty and peace, secluded and tranquil but not remote, for it offers the prospect of visiting the Coast or just relaxing by your own Private Pool, perfect for exploring Rural Spain on Foot or by Car. It is set within its own Garden and Olive Trees, midway between the two White Villages of Casarabonela and Alozaina, in the spectacular mountain region of the SIERRA de las NEIVES, Andalucia. Malaga Airport, Marbella and the Coast are only 45 minutes drive away. The nearest large town is Alora, also nearby are the spectacular El Chorro Lakes where boating, fishing and swimming can be enjoyed. We recommend that a car will be essential. Sleeps 6. 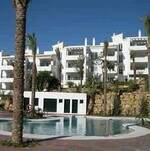 Luxurious brand new apartment on Alhaurin Golf, Spain, 2 bed, 2 bath, pool, fullY fitted kitchen, terrace, TV dvd, sleeps up to 6. Golf facilites on site. Alhaurin, a beautiful village which dates from Roman times is 5 minutes from the apartment. The village is at the foot of the Mijas mountains viewing the Guadalhorce valley with its orange and lemon trees. Alhaurin, with a population of 20.000 inhabitants, enjoys a mixture of town and country life. You can go for a walk in the mountains, try some of the local "Tapas" (small snacks) or have a drink at any of the bars and disco pubs. Thanks to its wonderful climate you have the opportunity to practise a wide variety of sports and activities. Mijas Pueblo, Marbella, Alhaurin el Grande, Malaga. Sleeps 6. Modern apartment with marble floors air con, central heating & large balcony. Accomodation comprises 2 bedrooms, one with 2 single beds and one with a double bed. There is a corner unit in the sitting room which can extend to make another double bed. There is one large bathroom with a bath & shower facility. Amenities include satellite TV with 60 English programmes as well as foreign channels, full kitchen facilities, cooker with ceramic hob, microwave frig. dishwasher, washing machine & tumble drier. All linen is provided but bring your own towels for the swimming pool. There is wifi for internet access in the club courtyard if you have your own computer. There is a swimming pool with pool bar right beside the apartments set in a beautiful landscaped garden. the site has 3 paddle tennis courts a bowling green with 8 lanes and an equestrian centre. The 27 hole golf course is excellent. 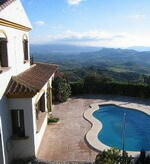 It has spectacular views of the mountains and of the Bay of Malaga. Buggies are available. Sleeps 6. This marble floored 2 bedroom 2 bathroom penthouse has been built and finished to the highest standard. The views of the mountains and golf course are exceptional. The penthouse is located very close to the four star Alhaurin Golf Hotel with its excellent facilities, restaurant, bar, pool, tennis courts & riding school. 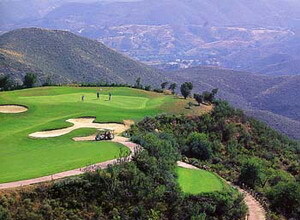 The Alhaurin Golf complex, designed by Seve Ballesteros and literally “cut out of the mountains” is situated between Mijas and Coin, high in the mountain range of the Sierra del Mijas. It offers incredible views of the forested mountains, the valley, the Mediterranean and distant North African coast line. This 18 hole par 72 golf course is challenging off the yellows and totally Tiger Woods off the whites! There’s a testing 9 hole par 3, that’s mainly over water and a driving range and golf academy. With an average of 320 days of sunshine in excess of 20 degrees and 90 other golf courses between Malaga and Gibraltar - this is indeed a Golfers Paradise!! Sleeps 4. This villa with a closed and raised garden is located in a residential district calms of Alhaurin de la torre to 8 kilometers of the beaches of Torremolinos on Costa del sol and to 12 kilometers of Malaga. 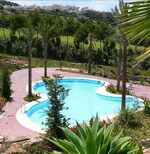 Many golf courses will be at your disposal and in particular Lauro golf with 4 kilometers. Its capacity of reception is of 10 persons or possibly 12 by using the sofa bed of the living room+ 5 sharing ground floor room. From will its central geographical situation in Andalusia, you be able to visit the historical center of Malaga, the caves of Nerja, Ronda and its typical village, will l'Alambra of Grenade, Giralda of Seville, the mosque of Cordoue and other sites like Marbella, Jaen, Cadiz, etc... As regards will the night exits, it be enough for you to go towards the beaches where will at will find there you bars, restaurants, pubs, discotheques, etc. Terrace shaded (pieces of furniture garden 12 people). Swimming pool 6x12m with 12 long chairs. Sleeps 17. If you are looking for a unique golf destination, then no doubt, Spain is the country. Spain has been a preferred golfing destination for most of the golf enthusiasts of Europe as well as for the rest of the world for years. The Andalucia area of Southern region of country is one of the biggest points of concentration for its golf courses. The native citizens call this area as "Costa del Sol the Golf Coast". In this smaller region, there are around sixty international class courses which have been designed by expert designers while considering even the minor requirements of golf players. The golf courses of Olazabal, Ballesteros and Nicklaus are the most popular ones. Some golf courses owners have also established their own restaurants and hotels to render the foreign travellers a complete touring package. World renowned country club and Alhaurin courses offer around eighteen holes golf course which is planned and designed by "Severiano Ballesteros" and provides stretched fairways with demanding water holes. Among all facilities offered, the most appealing are on site restaurant and hotel. Another is Campo de Cordoba, an eighteen hole golf course in Parkland which, all the more increases the joy of golf tours Spain. With eleven doglegs, tree surrendered fairways and 4 holes, the golf course seems to render the best golfing experience. However, if you want water all around the golf course, then you will definitely like Golf de Puerto. It is an eighteen hole golf course which was planned by a previous golf player namely "Manuel Pinero" to confront the most enthusiastic players. The golf course of Andalucian APG is another notable golf course which hosts a number of international as well as national level golf tournaments. The details of the golf course are as, 18 holes, and 6314 yardage. However, thorough research about the particular course will definitely prove helpful in making your golf tours Spain pleasant ones. If you are a golf fanatic, but narrow, long fairways play as an obstacle in the game, then you are free to opt for the golf courses that are designed by keeping this problem in mind. If you are going to travel to Spain for the first time, then you definitely need to consult some golf tour Spain specialist. There are several tour operators or travelling agencies that offer fantastic golfing packages for the convenience of foreign as well as local customers. The different facilities provided by these golfing packages include discounted green fees, tee time fees and booking of hotels and restaurants. Moreover, researching about different golf courses in Spain through internet can prove a good way to make the trip delightful as it will also save your time. You can also book your desired golf resort or hotel in advance through internet. Do not underestimate the incredible beauties of Spain, warm waters of Mediterranean Sea and various full fighting grounds. So, if one is keen to spend the golf tours Spain delightfully, then researching about the booking rates, flight prices and hotels and restaurants will, of course, add more to the enjoyment.